While some of its meaning may have changed over the years, in these last dog days of summer, we may all be feeling some tell-tale signs of elevated pitta. We may be uncomfortably hot, impatient, and irritable. We may feel excessive heat in our eyes, bellies, or joints. Or we just may feel a bit like those canines on the porch. Regardless of how pitta may express itself at this time of year, Ayurveda assures us that we can counter this expression. We can add a calming influence on pitta’s fire, so that we can shine bright—like a cool morning star. One delicious way of countering pitta’s heat is by introducing the three tastes known to soothe pitta dosha—sweet, bitter, and astringent. 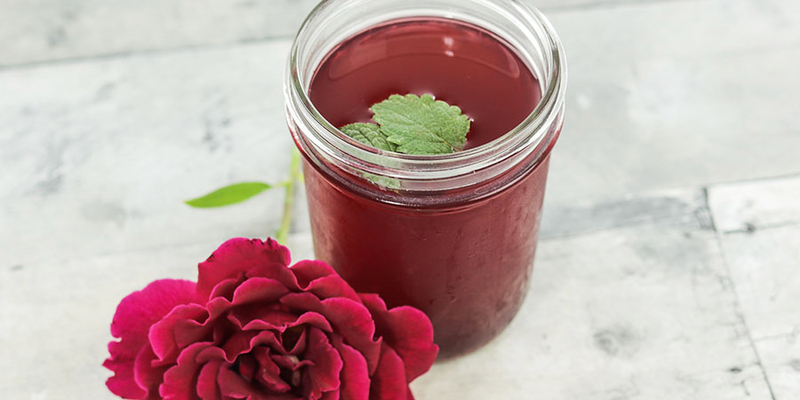 The following recipe is a refreshing and restorative tonic for pitta dosha, incorporating all three of its balancing flavors. The following ratios are for a quart-sized jar. Adjust to your liking. Place the herbs in a jar, add the hot water, and let sit. Add orange juice, berries, mint, and rose petals after the water is no longer hot. The longer the herbs and fruit steep, the more flavorful the tea. Allow to cool, chill slightly, and enjoy. Here’s to pitta dosha, the dog days of summer, and shining bright! Cheers! Summer is Pitta Season! Those with abundant pitta in their constitution may want to accommodate for the bright, hot, sunny days of summer. Here are some suggestions. Cucumber water is getting boring. Mint and lime are delicious, but overdone. I have been craving something…more. A little more body, a little more flavor, something to really cool me down. Luckily, I came across Amadea Morningstar’s Pitta Soothing Tea recipe at exactly the right time.